Many are seeing their decision to boycott the upcoming polls as a “watershed moment” in the state's politics as these parties have often faced accusations in the past for representing Delhi and not J&K. Srinagar: On September 5, National Conference president and three-time chief minister Farooq Abdullah announced that his party would boycott the upcoming civic body polls in Jammu and Kashmir until the Centre assured protection for Article 35A. Three days later, he toughened his stand when he threatened to withdraw from the 2019 general elections and state polls as well. The People’s Democratic Party (PDP) followed its political bête noire on September 10 as party chief and former chief minister Mehbooba Mufti too decided to stay away from the electoral exercise. The extreme step taken by these parties, many believe, is a desperate attempt on their part to side with people on an issue that has deepened anxiety in the Valley, hoping it would earn them some public sympathy at a time when mainstream politics is faced with credibility crisis in the Valley, post the 2016 uprising. But the Centre, by refusing to hold out any sort of assurance to these regional players on the protection of the constitutional guarantees and instead by sticking to its decision to hold the polls, could end up dealing a blow to mainstream politics in restive Kashmir. For long, regional political players like National Conference and PDP have sustained their politics around two key issues – dialogue with Pakistan and separatists towards a resolution and protection of the state’s special position and its unique identity within the Union of India. On the dialogue front, the Congress, during its ten-year rule and now the BJP, have blown hot and cold to suit their politics at national level, often leaving state parties in lurch. Now, the assault on the state’s identity – be it the challenge to Article 370 or Article 35A, in Supreme Court, or the recent remarks of National Security Advisor Ajit Doval that J&K constitution was an “aberration” – has put these players in a precarious position. In fact their political survival is on the line. It is little wonder then that these parties reacted sharply and angrily to the Centre’s move to link Article 35A case in the Supreme Court with the polls in the state. Many even saw their boycott decision as “watershed moment” in Kashmir politics as these parties have often faced accusations in the past for representing Delhi in Kashmir and not other way around. 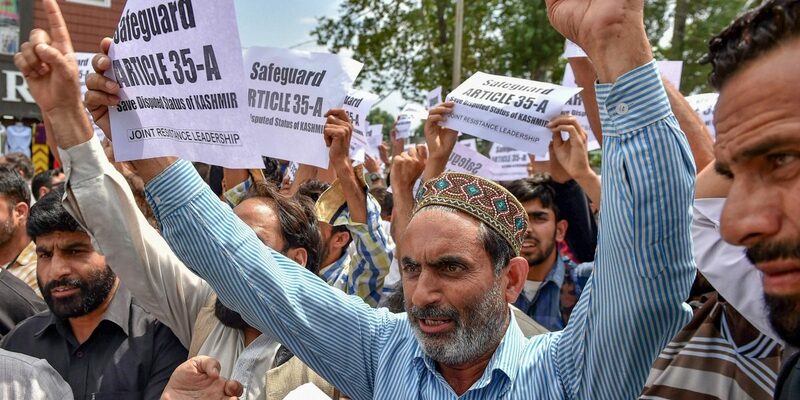 “The government of India’s stand on Article 35A has further weakened their [the political parties’] position in the Valley, in the sense, they have faith in legal constitutional mechanism of India, but the very system to which they owe their allegiance has refused to side with them,” said political commentator Noor M. Baba. The poll boycott by these parties, argued Baba, is an “act of desperation as well as hope” by them to be seen rallying for an issue (state subject law) which was very dear to people and linked to survival and identity in J&K. At the same time, he argued, New Delhi’s stand on Article 35A would only end up strengthening stand of hardliners and separatists. 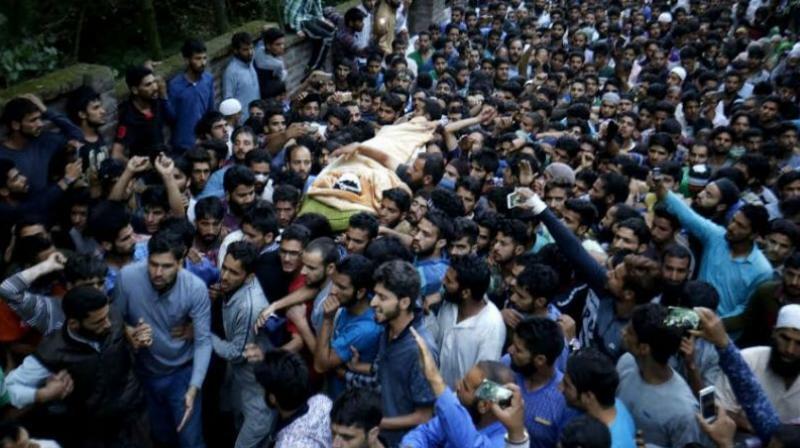 Ever since the mass uprising swept Kashmir in 2016, following killing of popular rebel commander Burhan Wani in July that year, the mainstream parties have got pushed to margins. The anti-militancy operations by security forces in the past two years and killing of civilians at gunfight sites have only meant there has been no thaw in protests. This in turn has impacted mainstream politics to the extent that none of the parties have been able to hold any major political programme in the Valley, particularly in south Kashmir which was the epicentre of the uprising and now a battleground between forces and rebels. “These parties were looking for some kind of hand holding from Delhi to come out of this crisis in Kashmir. Any sort of guarantee on state’s special position would have helped them to sell it in their constituencies, but Center’s ambiguous stand on Article 35A has only exposed them,” argued noted political commentator Zafar Choudhary. Article 35A empowers J&K legislature to define permanent residents of the state. The constitutional provision has been challenged in the Supreme Court on the ground that it was incorporated in Constitution of India without any debate in Parliament. If the provision is done away with, citizens of J&K will lose all exclusive rights under the state subject law like right to property, employment and settlement. On the last date of hearing on August 31, the apex court deferred the case to January 2019 after the state and Union governments pleaded for the same, citing panchayat and urban local body polls and political disturbances in Kashmir. The linking of Article 35A with the polls has led to fear in Kashmir about fate of the constitutional provision. And in the face of these fears, if any regional political party jumps into electoral fray it would be seen as committing political suicide. This has now aggravated the situation to a point where the Centre and state parties are stuck in a collision course, making it difficult to predict what kind of shape politics takes in the Valley in days to come. “How can we go to people and ask for votes when the sword of Article 35-A is dangling on our head,” Mehbooba told reporters on September 10. She even talked about the fears. “Why did they [Centre] seek deferment of hearing till elections are over? Does it mean that they are going to do something with Article 35A? Today ,people have apprehensions that once elections are over, the government of India would fiddle with the state’s special position,” Mehbooba voiced her concerns. According to Choudhary, the problem with mainstream parties in Kashmir is that they look for “emotional exigencies” in Kashmir, “ratchet up” an issue and when Delhi senses the sensitivity of the issue and offers an olive branch, these parties “succumb the moment they see the power factor in the olive branch and make compromises”. The extension of GST to state at the “cost of the state’s fiscal autonomy”; bringing J&K Bank under the control of RBI; silence of successive regimes in the state to the Centre’s decision of first shelving recommendations of former prime minister Manmohan Singh-appointed five working groups on dealing with political, economical and other issues confronting J&K and then silently burying report of three-member team of interlocutors, which was appointed soon after the 2010 uprising, to find the way forward to resolve Kashmir are some of recent examples where state political parties have been accused of making compromise for chair. There are also apprehensions that things could go worse if the state and the Centre continue on the collusion course. If state parties boycott panchayat elections and government of India doesn’t hold out any assurance to them that would leave the parties with no choice but to boycott next year’s parliament elections and state assembly elections as well, a situation National Conference has already said it was ready to walk through. On Thursday, the National Conference vice-president summed up the ongoing confrontation between the state parties and the Centre. “The fact that two major political parties (NC and PDP) of the state – the last three chief ministers have belonged to these parties – are not participating in these elections and if you (the Centre) feel despite these two parties not participating, these elections could be meaningful then go ahead,” Omar Abdullah, the former chief minister told reporters, endorsing his party’s poll boycott decision. This is the first time that mainstream politicians have announced an electoral boycott ahead of separatists, summing up the uncertainty mainstream politics is faced with in tense Kashmir.